Are You Measuring Your VDP’s Like You Would Measure Showroom Ups? If Not – You Should! As a car dealer, you measure showroom ups, phone ups, and Internet ups. Internet ups, however, usually refer only to people who emailed your dealership directly, or who completed an online lead form. What about your vehicle detail page (VDP) ups? After all, your VDPs show everything that a salesperson would review with a car buyer in the showroom: features, mileage, history, price, etc. Most buyers will check out the VDP of the car they want before coming to your dealership. If that is the case, how do you measure VDP engagement so you can get an accurate picture of your VDP ups? The first thing to do is to install event tracking on your VDPs through Google Tag Manager. Event tracking enables you to measure key visitor behaviors such as whether they are looking at pictures, watching videos, scrolling down the page, and clicking on widgets. 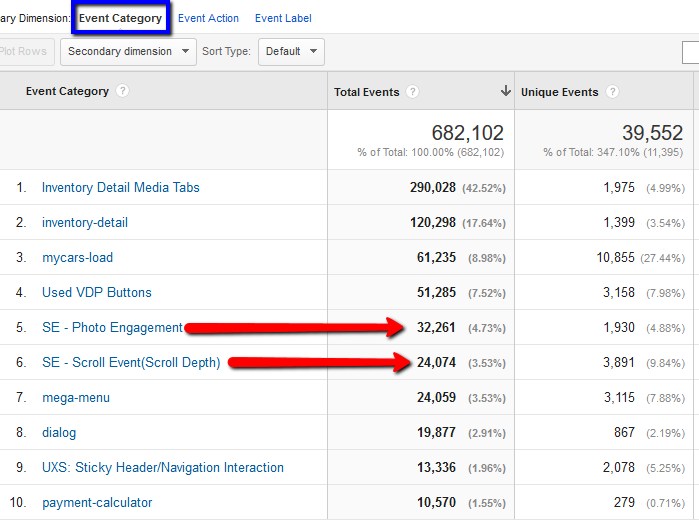 Event tracking also gives you more accurate metrics for time on site and bounce rate than Google Analytics can do alone. Join us March 3, 2016 for a webinar on this very topic, given by LotLinx’s VP of Business Analytics, David Salinas! Report based off of one month’s metrics for photo engagement and scroll events (scroll depth). Before event tracking, a GA dashboard might have looked like this for a one-month reporting period. After event tracking, a GA dashboard might look like this. With event tracking established to give insight into visitor behavior, you can also set goals in Google Analytics for your dealership. For example, you can set goals for how many new VDP views, used VDP views, and certified pre-owned (CPO) VDP views you receive per day, week, or month. You can also set goals for metrics such as bounce rate to alert you to potential problems. For instance, a high bounce rate from your home page – indicating that people are leaving your site immediately without looking at any VDPs – could indicate that your home page is not appealing or that your website is hard to navigate. In contrast, higher bounce rates on destination pages like VDP’s or your Schedule Service page, might make a bit more sense, and not necessarily indicate a problem. Setting goals helps to evaluate each traffic source. E-commerce sites such as Amazon pay attention to what people are looking at most and least – and you should, too. Which of your VDPs are getting the most views and the highest levels of engagement? Which are getting the least views and the lowest levels of engagement? These metrics can help you continuously improve your VDP pages by showing you what your target market is interested in seeing online. For example, are there certain models getting more views? Are there certain price ranges receiving the most traffic? Are pages with videos getting the most views? What is the optimum number of photos per VDP? How does a more customized description affect VDP views? Here’s a one month report showing VDPs with a high amount of pageviews. Here’s a one-month report showing VDPs with a low amount of pageviews. In addition to looking at how individual VDPs are performing, keep track of your overall VDP views. If you have ten visitor sessions online, how many VDP views does that net on average? What if you have 10,000 sessions? You can track general trends to see how sessions, events, marketing efforts, and special deals affect overall VDP views. For instance, you would want to know if a certain type of marketing campaign gave you a 30% spike in VDP views so that you could leverage that type of campaign again in the future. If you’re paying for PPC with the intent of getting shoppers to your VDP, it would be good to know what percentage of that traffic ended up on VDP’s. In this example, Google CPC is converting VDP views at 31.8%. How does this compare to other sources? With a good handle on how to measure VDP engagement, you can add VDP ups to the showroom ups, phone ups, and Internet ups you already track, and boost your business in the process!